The advent of intravitreal pharmacotherapy with anti-vascular endothelial growth factor (VEGF) agents has revolutionized the treatment of retinopathy of prematurity (ROP).1,2 These agents have many advantages over laser treatment for ROP, such as faster disease regression, less treatment administration time, less destruction of the retina, and a lower risk of myopia.1,2 However, limited evidence exists on the systemic safety profile of anti-VEGF agents with no level I evidence on the ocular, visual, systemic, and neurodevelopmental safety profile after their intravitreal use.3,4 This report highlights the development of bilateral cataract in aggressive posterior ROP (APROP) after intravitreal bevacizumab injection with no evidence of lens touch. A female neonate born at 28 weeks' gestational age with a birth weight of 1,050 grams was brought in by her parents at 32 weeks' post-menstrual age (PMA) for ROP screening. The infant had a history of respiratory distress requiring mechanical ventilation and sepsis in the neonatal period. Intravenous ampicillin and gentamicin were administered for 10 days to manage sepsis, with good response to these drugs. The ocular examination revealed minimal tunica vasculosa lentis, a clear lens, and zone I APROP in both eyes (Figure 1). Preoperative pediatric evaluation was unremarkable. Fundus photographs of the (A) right and (B) left eyes show dilated tortuous retinal vessels with avascular loops in zone I suggestive of bilateral aggressive posterior retinopathy of prematurity. After obtaining informed consent from the parents, intravitreal injection of 0.625 mg/0.025 mL of bevacizumab was administered in each eye under topical anesthesia in the operating room using a 30-gauge needle over a tuberculin syringe in the same sitting by a single surgeon. At 3 weeks of follow-up, the tunica vasculosa lentis had regressed, the lens was clear, and the acute phase of disease regressed in both eyes. At 6 weeks after intravitreal bevacizumab injection, bilateral total white cataract was noted (Figure 2). Anterior segment photographs of the (A) right and (B) left eye show total cataract in both eyes noted at a visit 6 weeks after intravitreal bevacizumab administration. Ultrasound biomicroscopy showed total cataract in both eyes with an intact normal posterior lens capsule (Figure 3), possibly ruling out an accidental lens injury by the needle while injecting. At 42 weeks' post-conceptional age, the infant underwent an uneventful lens aspiration, posterior continuous curvilinear capsulorrhexis, anterior vitrectomy, and posterior chamber intraocular lens implantation in both eyes. No evidence of intraoperative capsular dehiscence or scarring was noted (Figure 4). Lens, vitreous, and serum levels of bevacizumab were not studied. At 1 month of follow-up, a clear visual axis was noted with the fundus showing vascularization until zone II and regressed ROP in both eyes. A close long-term follow-up was recommended to the parents. Ultrasound biomicroscopy of the (A) right and (B) left eyes show an intact normal posterior lens capsule in both eyes. Intraoperative still photograph of the left eye shows an intact posterior capsule just before performing posterior capsulorrhexis. Cataract development can occur in association with ROP with and without treatment.5–7 The incidence of cataract development is reported to be 0.9% in eyes with treated ROP (laser/intravitreal bevacizumab/pars plana vitrectomy).7 Cataracts occurring after mechanical lens injury and cataract progression both are well reported after intravitreal bevacizumab injection in adults,4,8 with an incidence of approximately 0.14%.9 We previously reported the occurrence of bilateral advanced cataract 3 weeks after near confluent laser photocoagulation in eyes with APROP and suggested anterior segment ischemia as a possible mechanism.10 However, the current case had no history of laser photocoagulation and no such risk of anterior segment ischemia. To the best of our knowledge, this is the first case reporting delayed cataract development after intravitreal bevacizumab injection for ROP in the absence of iatrogenic lens injury. Early cataract may be missed clinically due to prominent tunica vasculosa lentis, but minimal tunica vasculosa lentis in this case allowed a reliable assessment that the lens was previously clear. Tunica vasculosa lentis per se is not expected to cause an effect on the lens with intravitreal bevacizumab injection. The mechanism of cataract development in this case is unclear because there was no evidence of iatrogenic needle injury to the lens; this was ruled out by preoperative ultrasound biomicroscopy and intraoperative capsular status, lack of ocular inflammation, and delayed development of cataract. Premature infants often have an amplified inflammatory response following intraocular surgery, although the absence of synechiae cannot reliably rule out ocular inflammation. 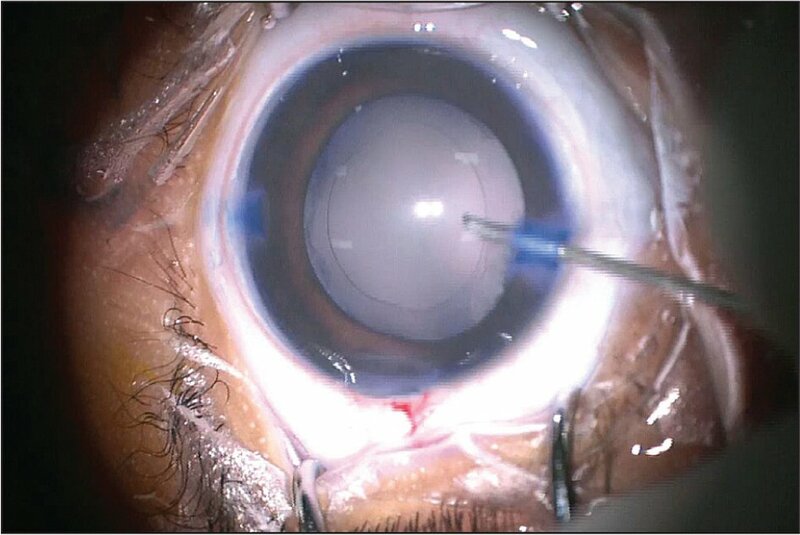 Although dragging of the vitreous adjacent to the lens during injection may theoretically lead to posterior capsular tear, the use of 30-gauge needles may prevent this occurrence. Experienced examiners performed the ocular examinations and mechanical injury during screening was unlikely. Because intravitreal bevacizumab is injected closely behind the lens in the gel vitreous in small eyes, the rare possibility of low grade drug toxicity needs to be further investigated. Bevacizumab drug levels in the lens, vitreous, or serum may have provided better insights into this case, especially because the minimal intravitreal bevacizumab dose that is safe and adequate to treat ROP is still unclear. Whether measuring serum levels of bevacizumab in all cases of intravitreal bevacizumab injection is feasible and beneficial needs to be assessed. Because the cataracts were bilateral, a systemic cause should also be considered. Limited literature exists on the causal effect of systemic antibiotics given in the neonatal intensive care unit in causing cataract, but its possibility cannot be ruled out.11,12 It may be possible that a developmental cataract appeared coincidentally while the patient was receiving treatment for APROP, but the rapid onset of the lenticular opacity within a few weeks of intravitreal bevacizumab administration negates this possibility. Such rare occurrences reveal there are still many limitations in our understanding of the safety profile of intravitreal bevacizumab injection in eyes with ROP. Darwish D, Chee R-I, Patel SN, et al. Anti-vascular endothelial growth factor and the evolving management paradigm for retinopathy of prematurity. Asia Pac J Ophthalmol. 2018;7:136–144. Chandra P, Khokhar S, Kumar A. Bilateral total cataract after laser treatment of aggressive posterior retinopathy of prematurity. Indian Pediatr. 2016;53(suppl 2):S157–S158. Ilarslan E, Aydin B, Kabatas EU, et al. Cataract in a preterm newborn: a possible side effect of linezolid therapy. J Coll Physicians Surg Pak. 2014;24(suppl 3):S281–283. From the Dr. Rajendra Prasad Centre for Ophthalmic Sciences, All India Institute of Medical Sciences, New Delhi, India.